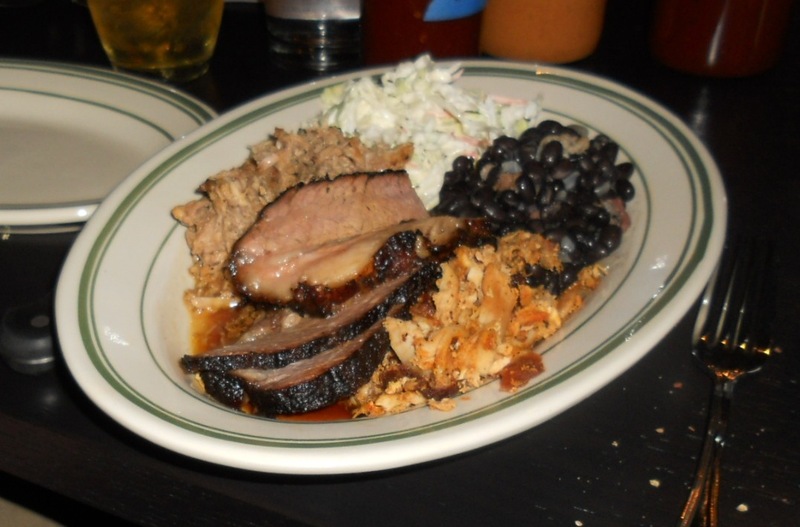 Last fall, the news that Frank Bonanno was expanding the subterranean space behind Wednesday’s Pie & Green Russell to open a barbecue joint met with some understandable skepticism, which I to some extent shared. As talented as he is, the move from chef to brand is one that precious few in the industry make with grace & integrity intact (the saga of Todd English being, for an ex-Bostonian, the ultimate cautionary tale). And as genuinely broad as his culinary interests may be, the barbecue buffs I know—& they’re a vehement lot—favor depth over breadth when it comes to pitmastery: the hallmark of the genre is a total, lifelong immersion in the ways & means of meat smoking & the culture in which it’s contextualized. Though that’s not limited to the Deep South, it doesn’t go much further north than the Mason-Dixon line or further east than Kansas City (&, she admits grudgingly, Texas). For connoisseurs to admit that a Jersey-born, French-trained toque could naturally deliver true ‘cue would be a stretch. Then again, to say that a Jew with a background in modernist poetry who scratched & clawed her way out of Oklahoma as a teen could naturally be any sort of expert on true ‘cue would also be a stretch. My point is this: I’m no expert on the stuff. I’ve done some studying as a food writer, & I know my bark from my smoke rings, my regional variants, & so on, of course. But what I do know, above all, is how something should feel in the mouth & taste based on the technique used to cook it. And thus far, the crew at Russell’s Smokehouse has dispelled any concerns I might have harbored as to whether they can deliver accordingly. Which brings me to the Dish of the Week: the loaded house chips, (pictured below right—by all means click to enlarge). A pile of hand-cut & fresh-fried potato disks is drizzled in funky gorgonzola cream & topped with pulled pork that’s not only tender, hickory-tinged & richly sauced but crisped in places, such that I wonder whether it was given a quick pan-fry out of the smoker or something. Adding a tangy, juicy kick are hot pickled red & green cherry peppers & fresh halved cherry tomatoes (which I think would be even better oven-roasted, but that’s a minor quibble). Pictured above left is a dish I already knew I adored: mushroom dynamite—a truly inspired take on the seafood-based, mayo-enriched casserole you find in stateside sushi bars—served with a warm, crusty baguette for spreading. It’s robust & gooey & every bit the equal of many a Bonanno signature, including his burrata. I already knew that because I’d gone gaga over it back at the friends & family opening last October, when the Director & I also split a combo plate that was solid but not stellar—the brisket a bit flabby & the pulled chicken a bit dry. That the pulled pork on the chips was so rockin,’ however, suggests to me the kitchen worked out some of those initial kinks (which is, after all, the point of soft openings). Likewise indicative: the evolution of the sliders. The inaugural version contained pulled rabbit, which I applauded on paper but which in practice didn’t quite gel, the flavor of rabbit being a little too delicate to withstand the sloppy-Joe-style treatment. 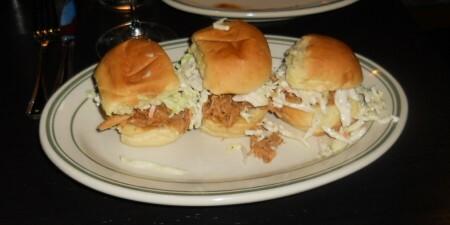 And although I was less enthused by the idea of the barbecued duck sliders currently available—they’re standard issue these days, after all—their execution proved a clear improvement: these sliders had punch inside & out, not only thanks to the stronger-flavored meat but because the buns are now housemade, with much better structure & chew than before. 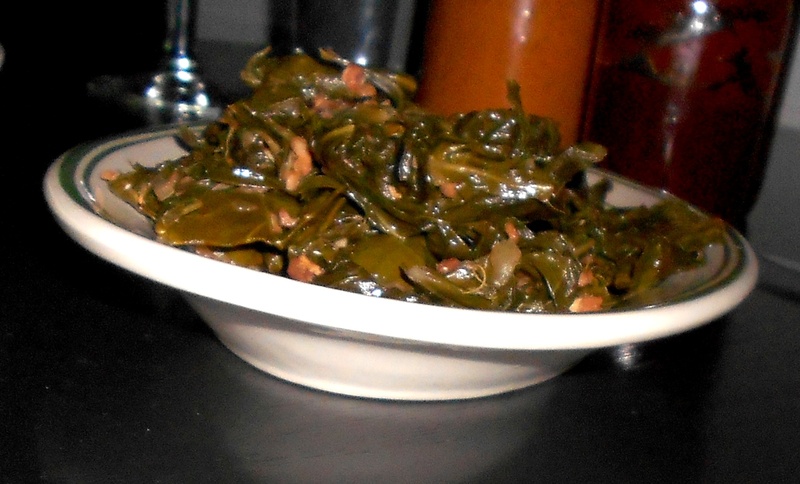 Moreover, the sauteed collard greens are downright killer, with lots of vinegar to balance their naturally iron-y, earthy savor & a generous smattering of crumbled bacon for salt & crunch. To state the obvious takeaway: don’t dismiss Russell’s Smokehouse based on preconceived notions of barbecue & its traditional environs & gatekeepers, any more than you’d dismiss, say, Phat Thai on similar grounds. Bonanno may be especially ambitious, but he’s not blindly so; he takes a clear-eyed approach to improving on both what’s not working & even what is, across the board. That’s been evident in my experiences at his joints, Lou’s Food Bar being a notable case in point—& that’s what cements his status as one of Denver’s key movers & shakers. Well I’m still skeptical, but the fact that they have collard greens means I need to make a visit.